Numberjacks is the latest phenomena for younger viewers to not only enjoy but also learn in this classic edutainment DVD. The series features all the odd numbers as girls and the even numbers as boys, ensuring a 50/50 split. These Numberjacks are also in the shape of certain numbers, whether it's four or six that lend themselves to the younger viewers through their colourful creations. To compound the situation for the Numberjacks, the Numbertaker is their arch-nemesis who steals all sorts of things from these humble little numbers and assists in the overall story telling process. These episodes involve all the numbers in a vairety of different quests and "problem solving" situations. For instance, in the episode "Nine Lives", the number 9 is caught in a puzzle bubble and needs to get out, whereas in One More Time, the number 1 causes all sorts of problems when she goes out alone. 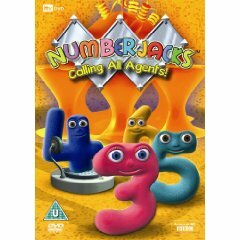 Solely aimed at preschool children, Numberjacks: Calling All Agents is definitely one DVD that parents can safely investigate for their children which not only teaches them the basics of numbers and mathematics but at the same time, offering some great entertainment.